The old mass mailer was functional, but a bit difficult to maintain and extend, especially with its HTML mail templating. 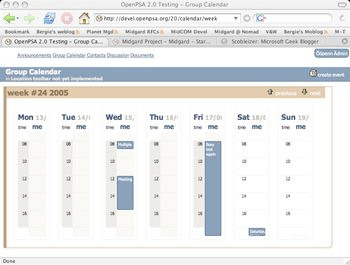 With the new component, org.openpsa.directmarketing, we’ve been able to learn the lessons from the old system and utilize Datamanager and MidCOM templating to provide a customizable and user-friendly templating and content selection system. The idea with the new component is that mailing lists are collected as Campaigns that can be either generated by hand-picking members to them, or by making queries to the Contacts component. If the campaigns have been populated by a query, they can also be made as a Smart Campaign where the members are automatically updated when query results change. When campaign has been populated, its member contact list can be downloaded in CSV or vCard (and of course hCard) format for making regular postal campaigns. In addition, the system enables regular emails, HTML emails, customized newsletters, and SMS and MMS messages to be sent to the campaign members. The mailing functionality uses Datamanager schemas for different types of content input, enabling developers to easily create new message templates. SMS and MMS messages will be sent using the Tambur HTTP API. I’m going to a friend’s wedding in St. Petersburg today, and will head toward the Budapest Red Bull Air Race afterwards, but Rambo will be working on the component. Commits can be watched in the CVS repository.